I used to - and by and large, still do - always think of strawberry as an early summer fruit. The berries, however, have somehow come to hit store shelves in December, and more and more in late November these days. I have my say as to why this started happening, but for whatever reasons, it still feels rather weird to find the berries in winter, although I do treat myself or family to some of them every now and then. 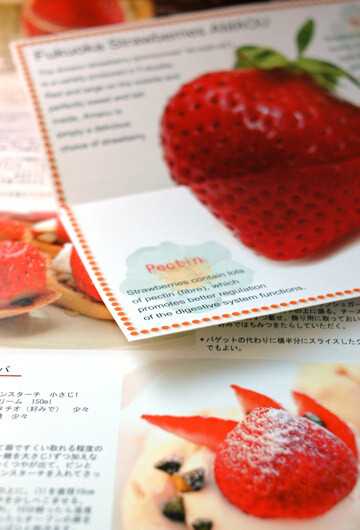 Last year I got involved in making promotional materials for a specific kind of strawberry called Amaou (pronounced "ah-ma-oh"), produced in Fukuoka, a southwest prefecture of Japan. This came as a second opportunity for me to do the job after the same sort of project I had done for figs for which I wrote recipes and shot pictures. 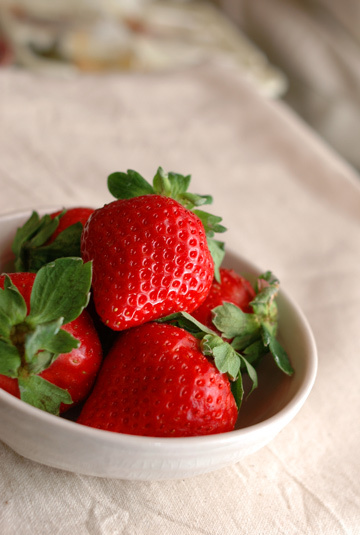 Amaou strawberries are a relatively new variety that is known for their large and round figure and they are scrumptiously sweet, standing out even among Japanese varieties that are generally very sweet. To highlight such qualities of the berries, we chose recipes that are simple and straightforward to make, including chocolate-coated berries, balsamic berries, and pavlovas. To secure a few picture-perfect specimens for shooting and some more for cooking, I had literally baskets of large triple-A grade berries, and was eventually left with way more berries than you would usually have at home at any given time. This means we had to be busy devouring large "leftovers" of this extremely perishable fruit before they got spoiled (I am afraid to admit, though, that some eventually did). And this made a great excuse to try many strawberry recipes for me, who loves strawberries so much she'd normally just eat all the stuff straight before turning some into any dessert. 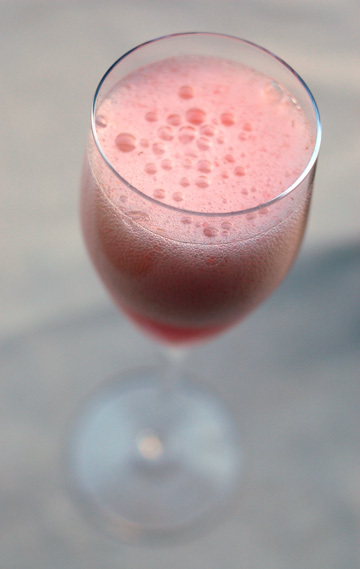 Pink strawberry bubbly, made with a pureed large strawberry and a small amount of sugar and Kirschwasser (cherry brandy) in a glass, with a pour of champagne or your favorite other sparkling wine. This creates really pretty pinky foams which disappear quite soon - so you might want to pour the wine at the last moment, cherish the pink, and gobble it up quickly. Cardamom-sugar dusted strawberries, made based on the recipe here. Berries are first tossed with Grand Marnier, then rolled with sugar mixed with ground cardamom. This was my first time pairing strawberries with cardamom, and I liked the way the clean, sharp scent of the spice complemented the sweetness of berries, slightly boozed up with the orange liquor. Hot chocolate with strawberries, in which pureed berries were mixed in thick and strong hot chocolate with a dash of Kirschwasser. The idea wasn't bad, but it actually didn't taste so much of berries, and the pureed fruits somewhat compromised the smooth texture of the drink, I guess. Well, that's that - next time I feel like berry-scented hot chocolate, I'll just pour raspberry brandy or something, or simply go for some chocolate-coated berries. Strawberry shortcakes. No, not that biscuit- or scone-like cakes you may be more familiar with. 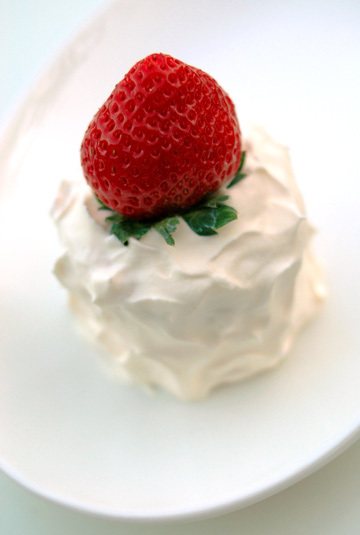 Take any Japanese person and ask him/her what a "short-cake" is, and you'd most likely be getting an answer, mentioning a large, round, sponge cake-based layer cake filled with whipped heavy cream and yes, fresh strawberries, among others. That's what we call "shortcake" over here, and in fact, that used to be what would represent "cake" in general, something that may come first to people's mind when it comes to cakes back when there weren't as many varieties of confections as we have now. Depicting a candle with a flame, my version was not exactly in a classic style, but we were pleased to taste something so cozily old-fashioned, albeit they didn't turn out as good as ones made by my aunt, who's always been a splendid cook and baker. 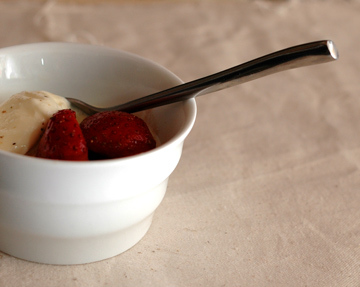 Olive oil ice-cream with balsamic strawberries, inspired by this recipe. 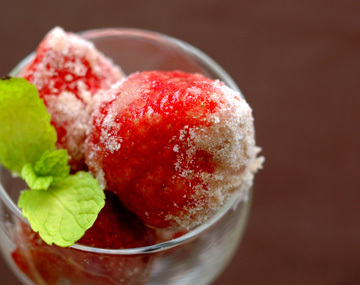 You may call fresh strawberries marinated with fragrant balsamic vinegar a "regular" in dessert lists, but how about one with olive oil ice-cream, rather than more common vanilla ice-cream? Since I couldn't be bothered to make my own ice-cream and instead simply blended some good olive oil into Haagen-Dazs vanilla ice-cream, this proved to be totally a no-fuss dessert that tasted sublime. 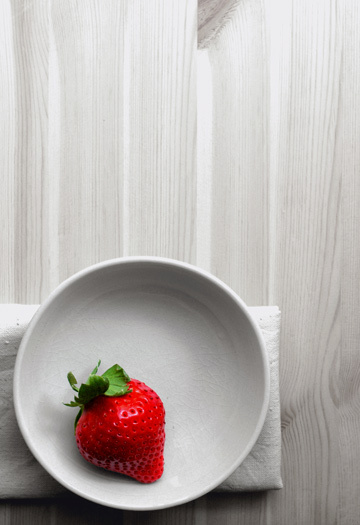 Scarlet fresh strawberries with subtle aroma of balsamic vinegar paired with rich ice-cream with a hint of savory olive oil indeed made an outstanding, addictive treat, a bite of which would make you want another, and yet another. Strawberry tiramisu. Actually, a simple web search will find you a bunch of varying recipes for "strawberry tiramisu" (I instantly found more than ten such recipes in English, French, and Italian sites), so this may not be an especially peculiar thing, after all. Mine consisted of finger biscuits soaked in coffee liquor syrup, layered with Grand Marnier-flavored mascarpone cheese cream, grated bittersweet chocolate, and slices of fresh strawberries, and you can't easily go wrong with this kind of things; I wouldn't daresay that there is something missing in classic tiramisu per se, but fresh berries certainly added a new and delightful dimension to this supreme dessert, and I was totally happy with it all. 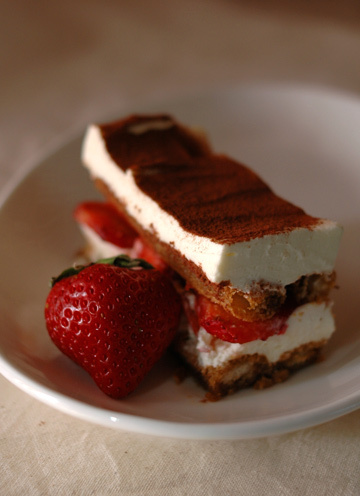 I love the sound of the cardamon dusted strawberries and the tiramisu. I always tend to make orange and mascarpone tiramisu and not sure why I've never tried it with strawberries. Will give it a whirl now that I've seen your fabulous photos. I love everything about your blog: the look of it, the sound of it and what I imagine is the taste of all those beutiful tnigs you write about. I'm in Belgrade, Serbia and Montenegro and we are just going through a horrible, grey winter, so your photos really made my day! THANK YOU SO MUCH! What an amazing post. I love reading your blog. You always have so many great ideas and recipes. I also had to say, which is why I'm commenting, that I LOVE, LOVE, LOVE your opening photograph! I love the white on white with the accent of red scheme.Gorgeous. I love strawberries and these are some very delicious-looking specimens! All the ones at my store look rather sad right now...what a wonderful treat to have strawberries in winter! I'm waiting for your next, colorful post! I truely love the pic of pink strawsberry bubbly, each of its bubble is tickling my tastebuds and sensation! Too beautiful for words. Keep the strawberries...I'll eat the pictures. Kia Ora (Hello) from a blogger down under in New Zealand. I really enjoy "looking" at your blog. I hope you don't mind if I mention your blog on one of my blogs - 21 21 21 - at # 668. I have also listed a blog of a man who is out to lose weight. Smashing pics! Everything looks SO delicious! maybe just me, but i found strawberries turn sourly very quickly ... is there a way around to slow down the process? Hi, my friend recommended your blog. I really like it. But I have a question about your strawberry recipes: if they are known for being very sweet, what's the point of dusting them with sugar or covering them with chocolate? Hi all, thank you very much for your comments! MM - I happen to love orange-flavored mascarpone tiramisu, as well :) If you like strawberries, you'll love the dessert with the berries, too. Aun - thanks, that's my favorite piece, too! slurp! - hm, I actually find strawberries tend to get rotten and/or moldy... I think they shouldn't be overrefrigerated, but they'll definitely need to be stored in a cool place as they are highly perishable either way. kemalcan - thanks for dropping by. 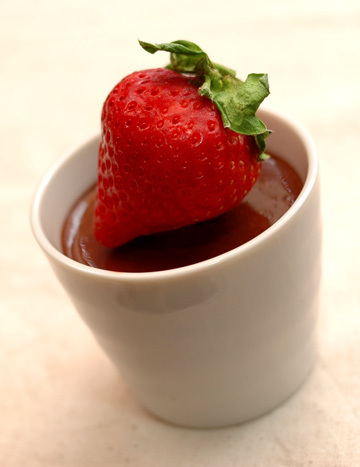 As for the recipes: the whole intention of the material I worked on was to promote the consumption of the particular variety of strawberries, so providing serving suggestions for the produce other than eating as is does make a point I guess. For the sugar-dusting thing in this post, it wasn't just to enhance the sweetness of the berries, but rather to build layers of flavors by adding a spice and liquor along with a little sugar. This should work with any strawberry but I used the sweet kind just because I had a plenty of them at hand. Let me introduce myself, I'm Paul, the owner of recipes365.net, I started this weblog recently to showcase a recipe a day everyday. I was wondering would you be interested to be a recipe contributor? It's true that the hit the store shelves early. They not be directly associated with valintines day (today!) but don't they make a perfect fruit a valantines desert?